Tousimis Research Corporation manufacture a comprehensive range of Critical Point Dryers for biological laboratory research applications. Manual, semi-automatic and fully automatic versions are available and a special series of supercritical CPD’s are available for MEMS/NEMS applications. The design concepts of the Tousimis Autosamdri® Critical Point Dryers are unique and their patent pending “Stasis” processing software ensures perfect critical point drying for all samples. For more information on Tousimis Critical Point Dryers, Please Contact Us. Emgrid Australia Pty Ltd is proud to announce that we have been appointed the Australian and New Zealand Agents for Tousimis Research Corporation. Tousimis manufacture a comprehensive range of Critical Point Dryers for biological laboratory research applications. Manual, semi-automatic and fully automatic systems are available and a special series of supercritical Critical Point Dryers are available for MEMS/NEMS applications. The design concepts of the Tousimis Critical Point Dryers are unique and their patent pending “Stasis” processing software, incorporated in the Tousimis 931.GL Critical Point Dryer ensures perfect critical point drying of the most difficult samples. Tousimis Samdri®-PVT-3D Advanced manual Critical Point Dryer, delivers highly reproducible results via manual controls. The Tousimis micro-metering valves and control panel are conveniently located for ease of operator control and automatic critical point temperature and pressure regulation are standard features with the Advanced manual Tousimis Samdri-PVT-3D Critical Point Dryer. Process chamber size 1.25″ diameter x 1.25″ deep. Tousimis Samdri®-795 Semi-automatic Critical Point Dryer, provides solid-state circuitry and simple push button operation. The Tousimis Samdri-795 Critical Point Dryer utilizes many presets and internal controls, yielding precise and reproducible process results. Process chamber size 1.25″ diameter x 1.25″ deep. Tousimis Autosamdri®-815, Series A Fully automatic Critical Point Dryer offers smooth process operation and precise control ensuring reproducible results. Process chamber size 1.25″ diameter x 1.25″ deep. Tousimis Autosamdri®-815, Series B Supercritical Critical Point MEMS Dryer for 10mm square die and 1″ wafers. Process chamber size 1.25″ diameter x 1.25″ deep. Tousimis Autosamdri®-815B, Series A Large capacity Fully automatic Critical Point Dryer, with a large process chamber 4.5″ ID x 1.25″ deep chamber. Tousimis Autosamdri®-815B, Series B Supercritical Critical Point MEMS Dryer for 4″ wafers, with wafer holders and inserts that allow anti-stiction processing for up to 5 pieces of either 4″, 3″, 2″ wafers or 10mm square die per process run. Process chamber size 4.5″ diameter x 1.25″ deep. The New Supercritical Autosamdri®-934 System was developed by the Tousimis in-house design team to incorporate your needs into their next generation. The classic features of smooth operation, precise control and reproducibility are again evident in their most current design! Tousimis Autosamdri®-915B, Series B Supercritical Critical Point MEMS Dryer for 6″ wafers, with wafer holders and inserts that allow anti-stiction processing for up to 5 pieces of either 6″, 4″, 3″, 2″ wafers or 5 x 10mm square die per process run. Process chamber size 6.5″ ID x 1.25″ deep. The New Supercritical Autosamdri®-936 System was developed by the Tousimis in-house design team to incorporate your needs into their next generation. The classic features of smooth operation, precise control and reproducibility are again evident in their most current design! The New Supercritical Autosamdri®-938 System was developed by the Tousimis in-house design team to incorporate your needs into their next generation. The classic features of smooth operation, precise control and reproducibility are again evident in their most current design! 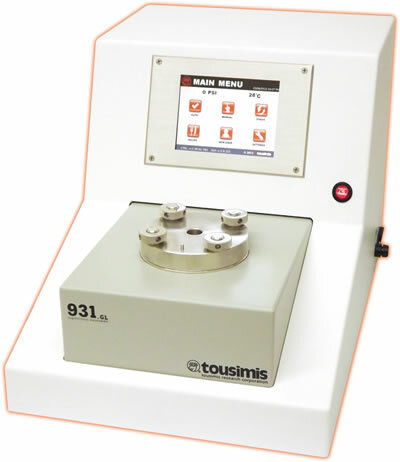 Tousimis Autosamdri®-931 Advanced Programmable Automatic Critical Point Dryer with “Stasis Processing”, chamber sizes 1.25″, 2.50″ and 3.40″ diameter.